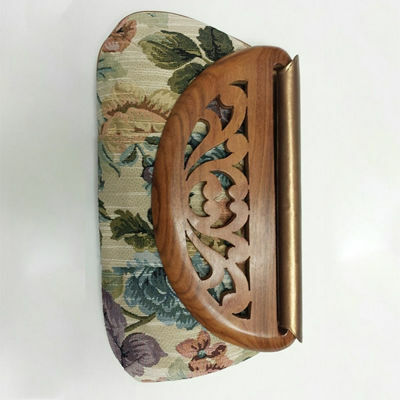 A unique wood flap clutch with floral fabric body. Attached with a bronze leather flap. Cotton lining with 2 pockets inside. 1 with zip closure. 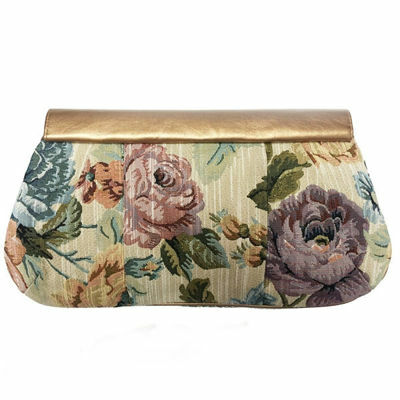 Ricki Designs a division of Le Chic Accessories was established in 1985 since then they have been crafting high fashion Handbags and accessories to the customers around the globe. 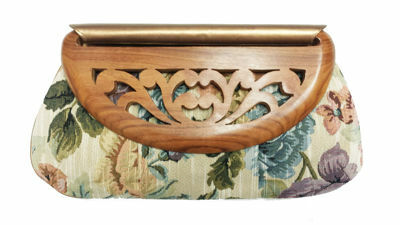 Their products are innovative, fresh and functional made by fine artisan using all natural materials like, silk, cotton, leather, glass beads and brass. All bags are handmade therefore carry their own uniqueness; it is a story of a community- a story of local skills and traditions, based on sustainable product and practices. Ricki Designs sells its products at High Fashion Boutiques from Beverly Hills to fine fashion forward chain stores across the country. 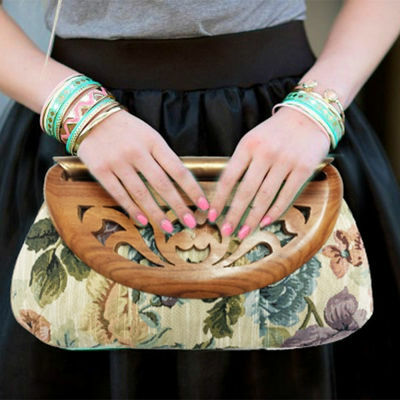 Ricki Designs Bags are available on SignatureThings.com with special pricing. Multi color button art and bead work clutch on black satin. Perfect for a glitzy evening out. Can be matched with semi formal and smart casual outfits in tones of blue, pink, peach, lime green, purple and orange. 1 cm multi beaded handle on dog hooks which can be removed and used as a chocker necklace. Deep green velvet hobo, with stripes and a sequence flower embellishment which is removable. Can be used as a broach.